Giving objects, even stationary ones, streamlined shapes was seen as a sign of progress and dynamism in the Depression years of the 1930s. Thanks to the emerging profession of industrial design and the need to enhance slumping sales figures, streamlined silhouettes were given to everything from buildings to buses and from cocktail shakers to vacuum cleaners. Furthermore, the modernity of these products was often enhanced through the use of new materials, including plywood, plastic, chromed steel, and aluminum. The end result was fashionable yet relatively inexpensive products that could be consumed on a mass scale and were not restricted to the wealthy upper class. 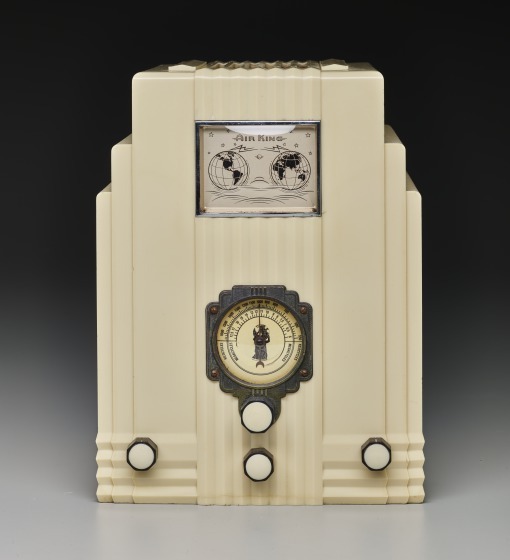 The innovative "Air King" radio (model 66) was groundbreaking in both plastics and radio design for its time. Until 1933, it was the largest Bakelite molding produced, and among American radios, it was a standout compared to its wooden predecessors. The casing for the radio features a stepped-skyscraper pattern, waterfall façade with an engraved plaque depicting a map of the world. Together, these unique attributes were quite modern for a radio of that era. 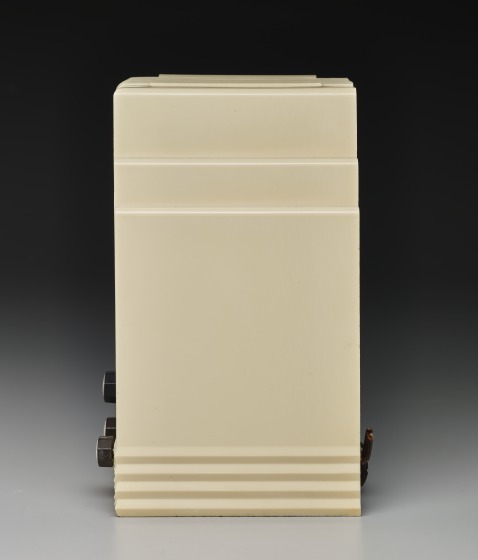 Air King industries produced three other models similar to this one in an array of vibrant colors like red, blue, and green, but by the end of the thirties the trend for lighter colors increased and manufacturers began producing radios in white- or cream-colored urea moldings or in darker phenolic resins sprayed white. Patrick Cook and Catherine Slessor, Bakelite: An Illustrated Guide to Collectable Bakelite Objects (Secaucus, N.J.: Chartwell Books), 1992. Robert Hawes and Gad Sassower, Bakelite Radios (Edison, N.J.: Chartwell Books), 1996.